With how much we use our HVAC systems around here, it makes sense that you would want to do everything you could to save energy, so that you could save money as a result. Well, the quality of your thermostat and how you use that thermostat plays a pretty big role in this, not only during the coming hot weather but in the fall and winter as well when you switch over to using your heater. Keep reading to learn more about the relationship between your HVAC systems and your thermostat, and to learn what your thermostat options are, from basic digital models to smart thermostats, which give you precise control over your heating and cooling. 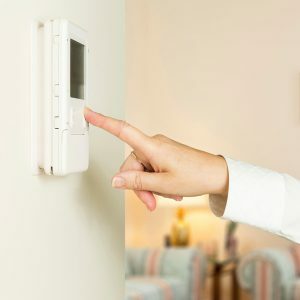 The thermostat connected to your HVAC system is essentially the brain of that system. It allows you to choose when the system turns on, and the exact temperature of your home at various parts of the day. Many homeowners have called us for HVAC repairs when in actuality, it’s not the HVAC system that has a problem at all. The components of the system are just fine, but they’re not being properly controlled by the thermostat. And a thermostat problem, understandably, impacts your ability to control the HVAC system. The end result can be just as bad as having a problem with the HVAC system itself since it could render the system useless, or at least inefficiently. We want to help you save money and hassle, so if you suspect you have thermostat problems, or want to look into a thermostat upgrade, be sure to contact us right away. There are a number of things that can go wrong when your thermostat malfunctions. For instance, if you cannot lower the temperature of your air conditioner in the middle of a hot day, it may never cycle on as you need it to. One of the biggest problems a malfunctioning thermostat can cause, though, is short-cycling. This is when your HVAC system shuts on and off rapidly, typically running just a few minutes at a time. The problem with this is that it causes your unit to work too hard in order to cool or heat your home, leading to premature repairs and potentially even a system replacement. In some cases, your thermostat may have been misused or was miscalibrated, in which case a quick repair will resolve. In other cases, however, you may need to replace your thermostat entirely. When you think about it, a thermostat replacement is probably the most affordable thing you can do when it comes to HVAC repairs, so don’t sweat it. The best thing about a thermostat upgrade is how much money it saves you, especially if you invest in a smart thermostat. A smart thermostat “learns” your cooling and heating habits and automatically adjusts accordingly to bring you the most efficient and cost-effective performance possible. If you’re looking for reliable efficiency tips and HVAC services in the Chicagoland area, contact Shavitz Heating and Air Conditioning today! What Goes On During AC Maintenance? Have Your Ducts Been Performing Well This Summer?